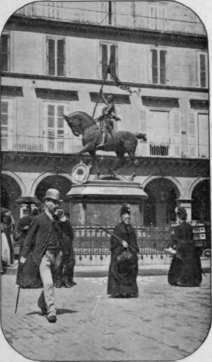 In strolling down the Rue de Rivoli, one sees a singular statue representing Jeanne d'Arc, bearing triumphantly the standard of the Fatherland for which she nobly lived and bravely died. This statue is to me one of the most remarkable sights in Paris; not as a work of art, for it has many faults, but on account of the sentiment connected with it. At least one wreath of flowers is always lying at the horse's feet. Sometimes there are no less than twenty there, each one deposited with respect and reverence by deputations from various provinces of France. They signify that Jeanne d'Arc, by her absolute devotion, unselfishness, and martyrdom for France, is the personification of pure patriotism, - L'amour de la Patrie. It is a touching fact that, standing, as France does to-day, well-nigh alone in Europe as a great republic, she honors thus her mediaeval heroine. From the materialistic skepticism of this closing century this tender sentiment springs like a lovely flower from the asphalt of the pavement. Heaven forbid that it should be destroyed by ridicule! Mankind has made its greatest progress, not through the agency of its millionaires, but by the unselfish devotion of its poor enthusiasts. Napoleon, that master of the art of kindling enthusiasm, truly said: "Imagination rules the world." Not far from this statue of the national heroine of France, stands the world-renowned Theatre Francais, frequently called the "House of Moliere." To those who love and appreciate dramatic art, the memories of this building are inspiring. A score of years before the pilgrims landed upon Plymouth Rock this theatre was in existence, and was for some time managed by Moliere himself. 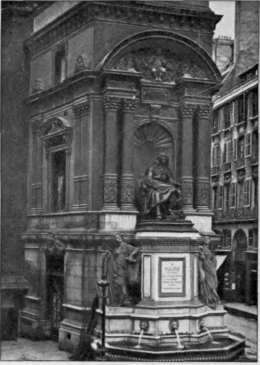 In 1768, Voltaire's last play was here performed amid thunders of applause, - the author himself, then seventy-four years of age, being present; and on this stage the indefatigable Moliere, working till the last, was stricken with paralysis and died within an hour. Statue Of Jeanne D Arc. It is not difficult to understand how the Theatre Francais has acquired its brilliant reputation. Its company represents the very best that study and artistic training can produce in France. No care is omitted by its directors to foster genius and to give an opportunity for its display. Its humblest actors would be stars on any other stage, but here they are only members of a brilliant constellation. Even the part of a lackey is here rendered with consummate skill. In order to become an actor in the The-atre Francais, one must have graduated from the French Conservatory, to which one is admitted only after a severe examination. Then a public trial must be undergone before the most experienced of Parisian critics. Those who pass this successfully may be accepted at the "House of Moliere," if there are vacant places there; but usually the candidates appear for a time on the preparatory stage of the Odeon. Moreover, this theatre, which has a fund reserved for pensions to be paid to its retired actors, is subsidized by the Government as a means of national education, and a certain number of the classic dramas of Racine, Corneille, and Moliere must be performed here every year. 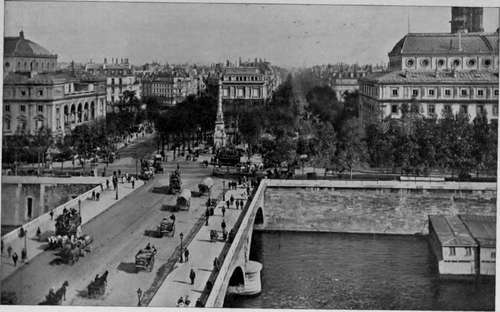 Place Du Chatelet And The Seine. Directly behind the Theatre Francais, the tourist enters that interesting portion of old Paris known as the Palais Royal. 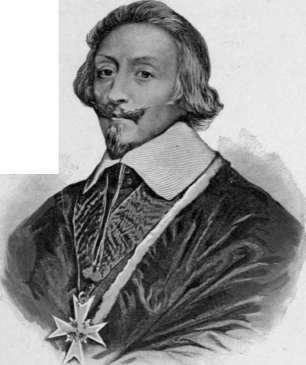 When this magnificent palace was the home of the all-powerful and wily Cardinal Richelieu it was naturally called the Palais Cardinal; but, after his death, having become the property of the King, it received the royal title which it still retains. Architecturally the Palais Royal is little changed. Its arcades are the same, and two or three of its renowned cafes remain. 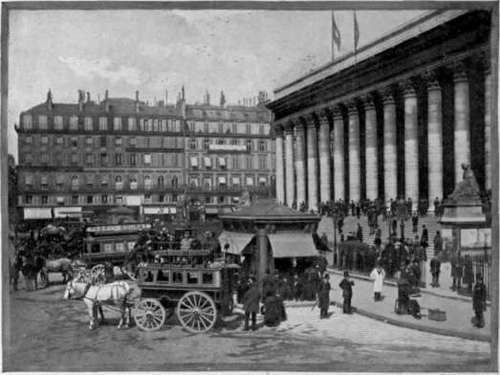 But the glory of its shops, which forty years ago were unsurpassed for richness of display, has passed away, most of the leading jewelers having migrated thence to the boulevards or to the Rue de la Paix. 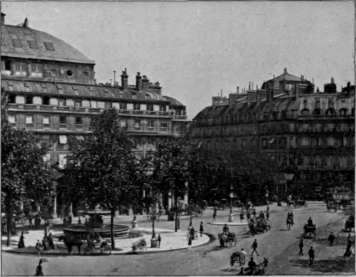 This famous building, too, although associated with some of the most thrilling epochs in French history, was set on fire by the Communists, and narrowly escaped destruction, together with the adjoining theatre of Moliere. 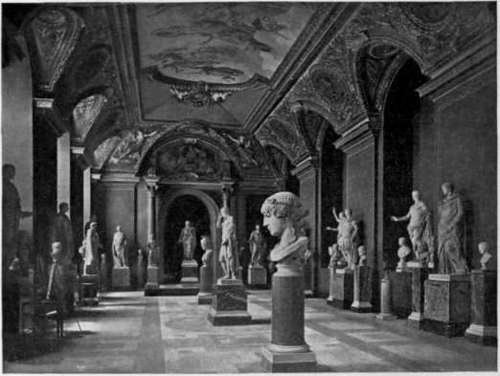 The world hardly appreciates how little of ancient and artistic Paris would have been left, had not the anarchists been thwarted in their horrible designs. 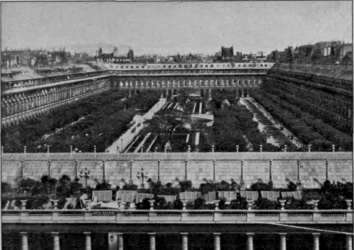 One hundred years ago this garden formed the favorite rendezvous for respectable citizens, who here discussed the affairs of state, much as the old Athenians did within their market-place; and here, one day in 1789, the tidings were proclaimed that Mirabeau's famous appeal to the King had met with an insulting answer; that between Paris and Versailles were massed fifteen regiments of foreign mercenaries; and, finally, that the very next day was the time appointed for the people's delegates to be dispersed, arrested, or imprisoned, according to their notoriety; while any persons who resisted were to be mercilessly cut man, named Camille Desmoulins, his eyes gleaming with rage and tears, sprang upon a table in this garden, and shouted: "To arms! To arms! The Work Of The Communists. This very night the Swiss and German troops are to march hither to massacre us. We have but one recourse. It is to defend ourselves!" This was enough. With lightning speed the cry passed through the surging crowd, - " To arms! To arms!" A sign was needed to distinguish friends from foes. 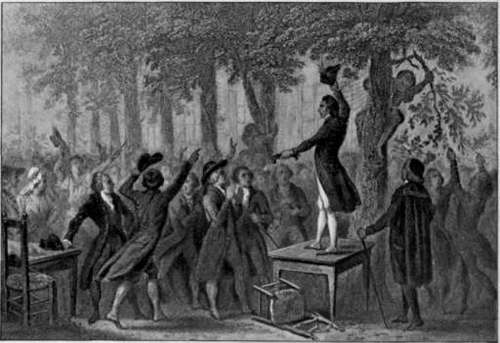 Desmoulins plucked a green leaf from a tree and placed it in his hat. This was the origin of the green cockade. Immediately all the trees in the garden were stripped of their foliage. The words and act of Desmoulins had in a moment called into existence an army and a uniform. 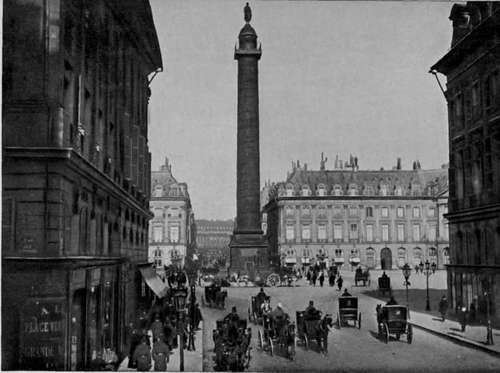 In the very heart of Paris rises one of the most imposing monuments of Europe, - the Vendome Column. Like so many other famous features of the French metropolis, it is a creation of the first Napoleon. For Bonaparte never thought a triumph complete till he had reared a monument to guard its memory; and this commemorates the victory of Austerlitz. No one can pass this column without admiration and astonishment. The bronze of which it is composed was furnished by Austrian and Russian cannon captured in battle by the French; and its entire length from base to summit is covered with elaborate bronze figures in relief, forming a miniature army, with cannon, horses, and accoutrements, ascending in a spiral path to the colossal statue of the Emperor above. The figure on the summit has not always stood here. When, after Waterloo, the Bourbons once more governed France, they took Napoleon's statue down. It was the one which represented him in the cocked hat and old gray coat, immortalized on many a field of victory; and Louis XVIII no doubt believed Chateaubriand's words were true: "If that gray coat and hat were placed upon a stick and planted anywhere upon the coast of France, it would cause all Europe to run to arms from one end to the other." Not content, however, with the removal of that statue, the Bourbons put in its place a monstrous fleur-de-lis. 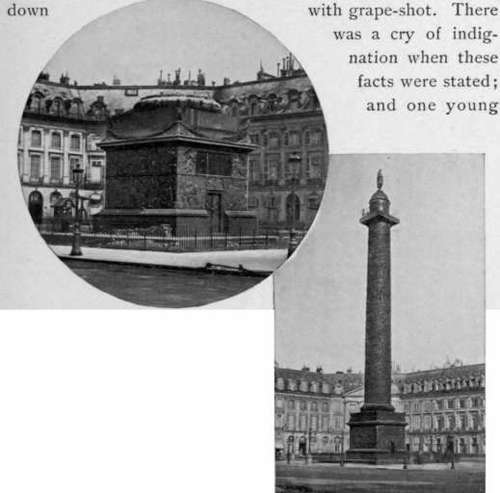 But this combination of the emblem of the Bourbon family and a memorial of Napoleon was so absurd, that Louis Philippe, yielding to the desire of the people, not only crowned again this shaft of triumph with the present figure of Napoleon (clad, less appropriately, in the garb of a Roman emperor), but even asked of England the return of the Emperor's body from St. Helena. This monument, too, was shamefully treated by the Communists, for they respected nothing. Religion, Art, and History meant nothing more to them than they do to the anarchists of to-day. Hence, animated by a senseless fury, they pulled over the entire column, - a thick bed of tan having been previously laid along the street to mitigate the shock of the concussion. Happily, however, the National troops arrived in time to prevent the destruction of the bronze reliefs, and both the column and the statue have been carefully restored.